Mount McKinley or Denali with a summit elevation of 20,320 feet (6,194 m) above level is in the National Park and Preserve,Alaska. 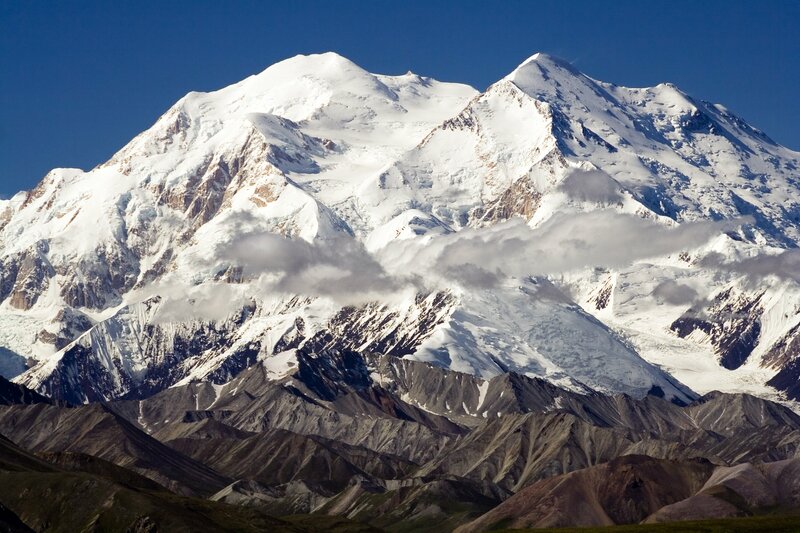 It is the highestmountain peak in North America and in the United States,. It is the third most prominent peak in the world after Mount Everest and Aconcagua but the weather conditions are severe where a climber may encounter 100-mph winds and -40°C(-40°F) temperatures. Even in July, temperatures as low as -30.5 °C ( -22.9 °F) and windchills as low as -50.7 °C(-59.2 °F) have been recorded. These low temperatures and sporadic high winds increase to a high extent the rigors of the climb. Snowstorms usually last a week and the unpredictable weather with the high altitude requires not only technical snow and cold weather skills, but also endurance and strength. The mountain is characterized by extremely cold weather, and by an unusually severe risk of altitude illness for climbers, due to not only its high elevation but also its high latitude. Climbing Denali requires a previous glacier climb experience and to be familiar with several snow and ice techniques, including self- arrest, cramponing, roped glacier travel and crevasse rescue systems.